If you have read any of my previous posts on Halwa, you would already know how crazy I am for a bowl of that yummy goodness. But that does not mean that I have tasted the different halwas there are in the world. There are still so many kinds that I am yet to try. So I decided I had to be a bit more adventurous and look at other cuisines. The word halwa/ halva or eluwa actually comes from the Arabic language and Middle East food cultures have a variety of different halwas. While a lot of halwa back home in India might be made of flours, dals or certain vegetables like Carrots and even Beets, Halwas in the Middle East are often made of nuts. I am yet to relish these nut based halwas like the ones made of Tahini and Sunflower seeds. 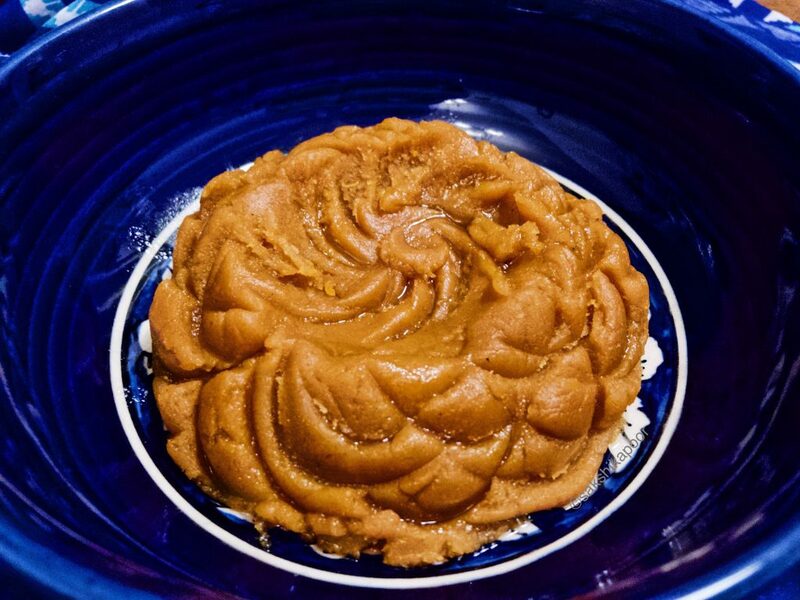 But when I came across this Emirati Pumpkin Halwa recipe by Anissa Helou in her book Sweet Middle east, I knew it was something I would not hesitate to try. And I have to thank Kanika for sharing this delicious recipe from the book for Milad ul Nabi or Prophet Mohamed’s birthday that falls this week. Fall = Pumpkin spiced this and pumpkin spiced that! Thanks to the onslaught of articles and social media posts related to pumpkin-this and pumpkin-that during fall, I gave in to the idea of a Pumpkin Halwa easily! Out of the two people who live in my house, I am the only one who doesn’t mind eating Pumpkin. The legends of the other one’s fussiness about certain foods has been chronicled well enough in this blog. So when I found out that the Emirati Pumpkin halwa uses flour as well, I knew he would not mind trying this halwa. I have found enough Gajar halwa like Pumpkin Halwa recipes on a number of Indian food blogs and channels but they just didn’t seem appealing enough to try. 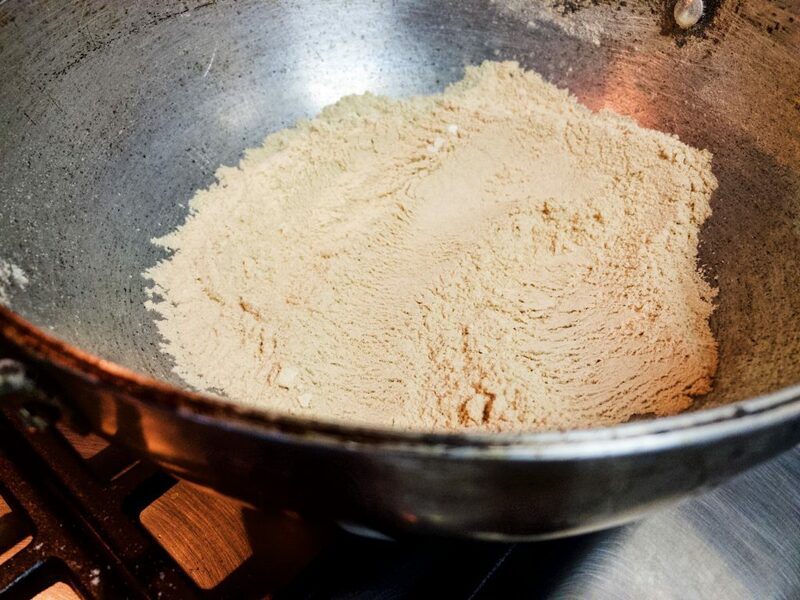 The nuttiness that roasted flour provides to a dish is unparalleled. It is also reminiscent of the flavour one finds in a Kadha Parshad. Incidentally, Guru-Purab also falls this week and I knew I would be craving some well roasted Kadha Parshad inspired Aata Halwa. So I had enough reasons to indulge in this sweet moreish dessert even after Diwali. Anissa’s recipe calls for un-bleached all purpose flour. Desi as I am, I usually just stock good old Aata or whole wheat flour in my pantry instead of maida and other baking flours. So I have used Aata here and have also used a different proportion from Anissa’s recipe. Here’s how I made Assidat Al-Boubar or Emirati Pumpkin Halwa. There are two major parts to this recipe. The first is preparing the pumpkin where we cook it down till it becomes mushy. When the pumpkin is being cooked, you can start roasting the aata on the side. Just be careful to not burn the aata while roasting it. If you are not confident of handling multiple pots at the same time, I recommend, you cook the pumpkin first and then move to roasting the flour. Start by washing and peeling the pumpkin. Cut it into cubes, not larger than an inch. 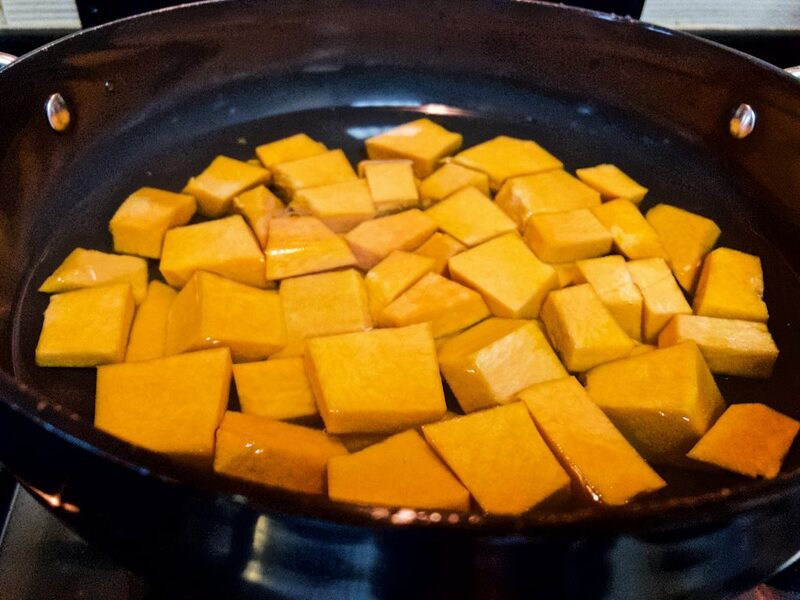 Transfer the cubed pumpkin with half a litre of water in a heavy bottomed pan and let it cook on medium high heat for 15-20 minutes. Cook till the pumpkin cubes become softer. 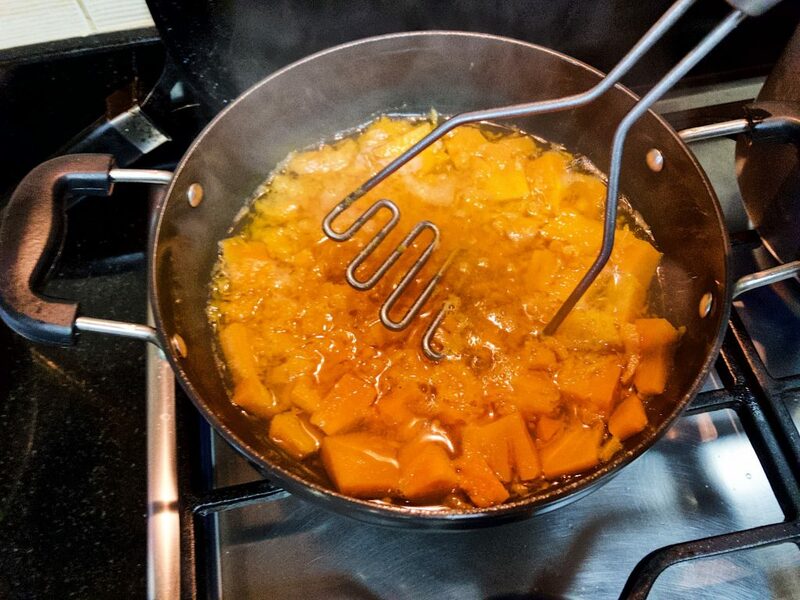 With a potato masher, mash the softened pumpkin cubes to break them down further. You will soon have a pumpkin puree. Once most of the water evaporates, add the sugar, crushed saffron strands and pounded cardamom. Cook till the sugar has dissolved. Now add the rose water or rose essence and mix it in. If you are not roasting the Aata simultaneously, take this pan off heat and keep aside. Place a heavy bottomed kadhai on medium low heat. 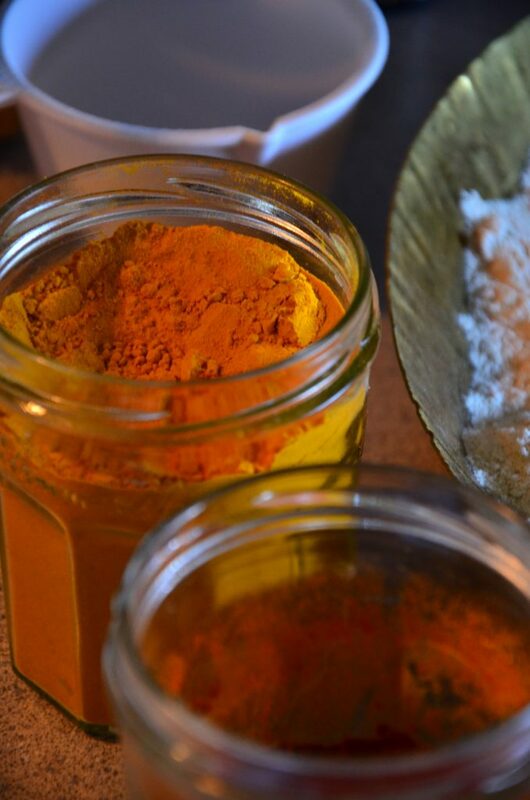 Once the kadhai is hot, tip in the aata and start moving it around the kadhai by stirring it with a spoon or spatula. The key to roasting any flour is to cook it on medium low or low heat and to pay attention to it by stirring it around the kadhai. 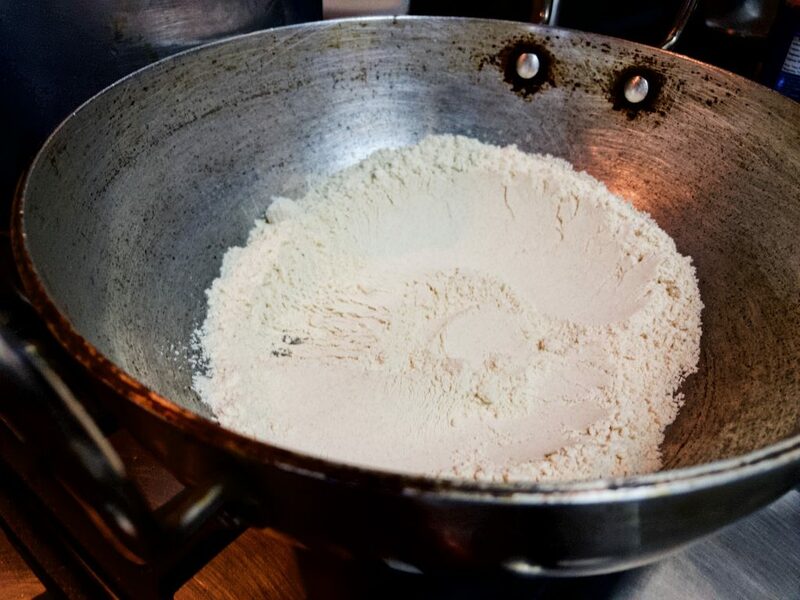 If the flour is not stirred well in a hot kadhai, the bottom layer will start burning and you’ll see the colour change. You can also read about this in our Kasaar recipe. The Aata will slowly start to change colour and if you pay attention to it and keep stirring it, you’ll see an even change of colour in the flour. The aim here is to cook the flour till it becomes a pale golden brown or till you can smell it’s nutty aroma. You can take the kadhai off heat when you think the Atta is almost the desired colour. Since the kadhai will stay hot for sometime, the atta will continue to roast. So you might have to still stir it around after you have taken the kadhai off heat. Back in the pan with the pumpking puree, ensure that the sugar has dissolved. Keep the pan on medium low heat and start adding the roasted Aata spoon by spoon. Mix the puree well with the roasted Aata to avoid any lumps. 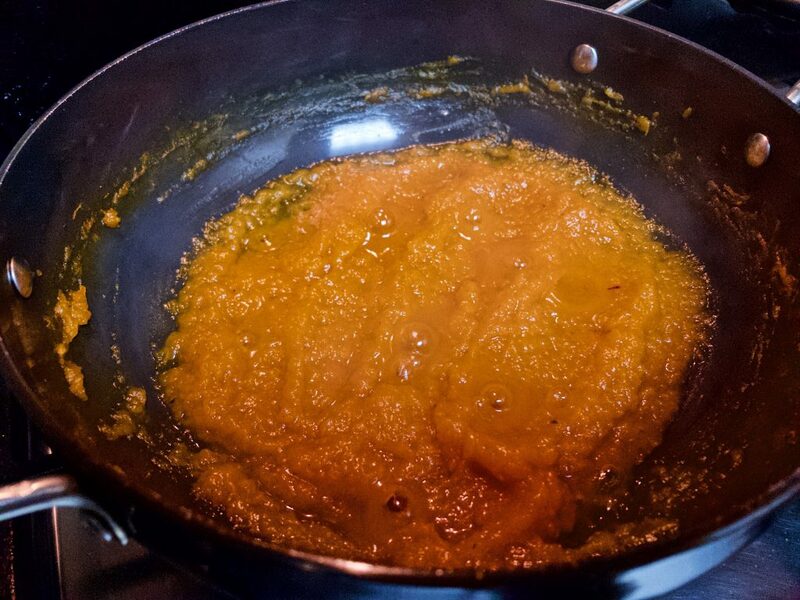 Gradually add all the roasted atta and stir the Pumpkin halwa well. 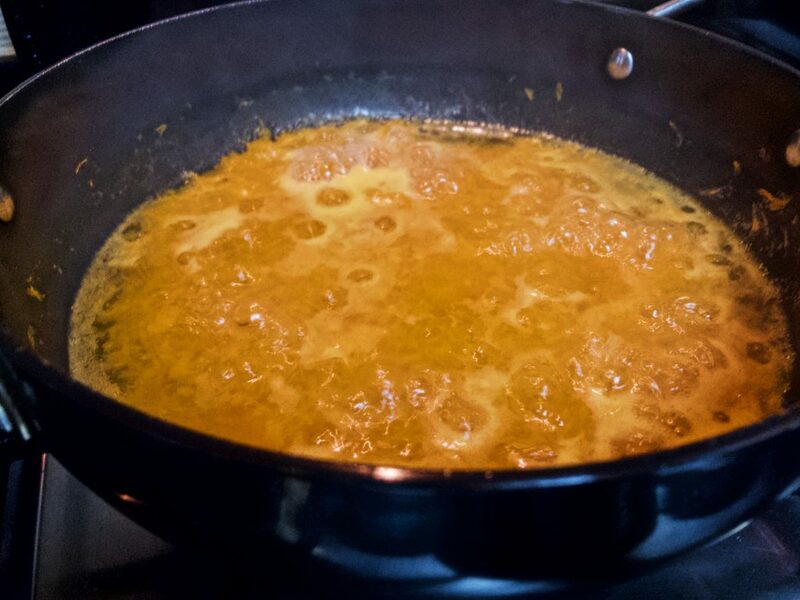 Now, add a tablespoon of ghee and mix well. 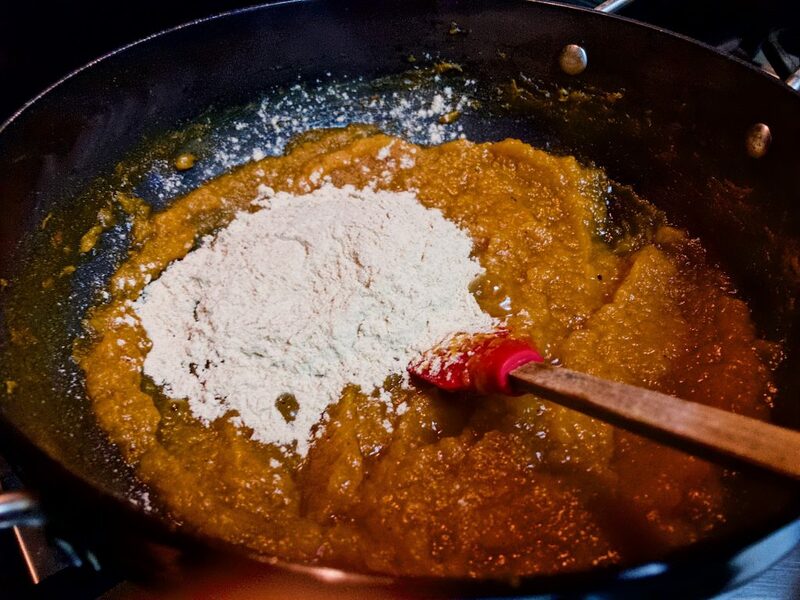 If you feel that the halwa looks dry and all the flour isn’t incorporated well in the pumpkin puree, add a few extra teaspoons (not tablespoons!) of ghee. Once it is mixed well, take out the halwa in small bowls and glaze with half a teaspoon of ghee on each. Make sure to not wait too long before serving as this ghee based dessert tastes best when it is warm. Serve this delicious Assidat Al -Boubar or Emirati Pumpkin Halwa warm with some crushed saffron strands on top or even some date syrup for extra sweetness! A delicious emirati halwa made with pumpkin and whole wheat flour and middle eastern flavours. It's the perfect cozy dessert for the fall. With a potato masher, mash the softened pumpkin cubes to break them down further. You will soon have a pumpkin puree. Once most of the water evaporates, add sugar, crushed saffron strands and pounded cardamom. Cook till the sugar has dissolved. Now add the rose water or rose essence and mix it in. If you are not roasting the aata (explained below) simultaneously, take the pan off heat and keep aside. Place a heavy bottomed kadhai on medium low heat. Once the kadhai is hot, tip in the aata and start moving it around the kadhai with a spoon or spatula. The aata will slowly start to change colour and if you pay attention to it and keep stirring it, you'll see an even change in colour. The aim here is to cook the flour till it becomes a pale golden brown or till you can smell it's nutty aroma. You can take the kadhai off heat when you think the atta is almost the desired colour. Since the kadhai will stay hot for sometime, the atta will continue to roast. So you might have to still stir it frequently after you have taken the kadhai off heat. Back in the pan with the pumpkin puree, ensure that the sugar has dissolved. Keep the pan on medium low heat and start adding the roasted aata spoon by spoon. Mix the puree well with the roasted aata to avoid any lumps. 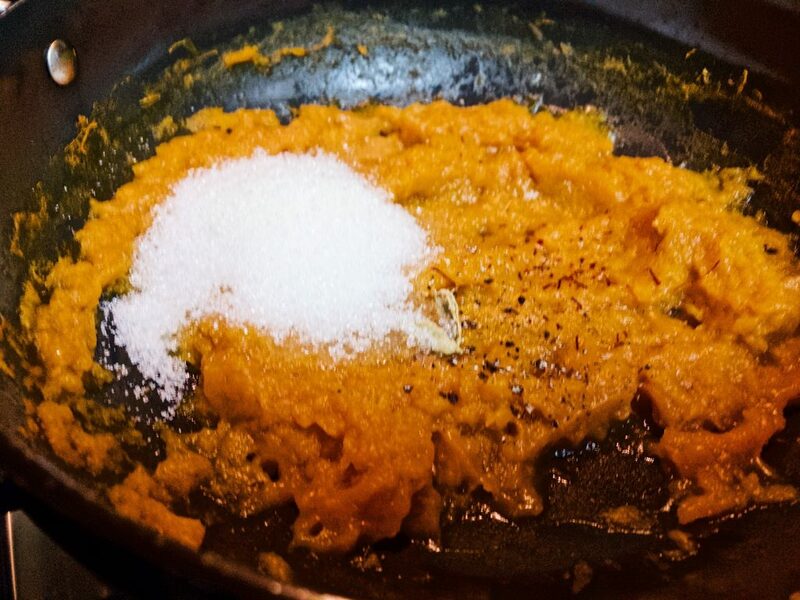 Gradually add all the roasted atta and move the pumpkin halwa around the pan. Now, add a tablespoon of ghee and mix well. 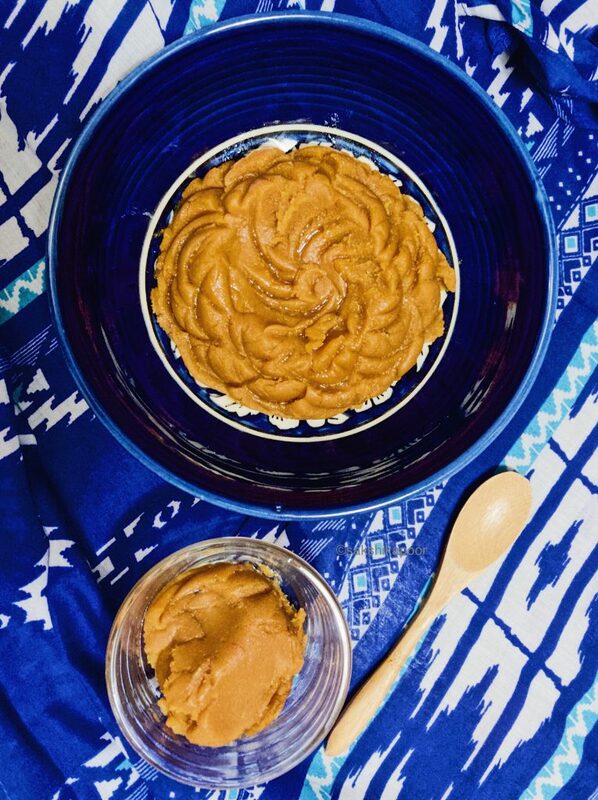 If you feel that the halwa looks dry and all the flour isn't incorporated well in the pumpkin pureé, add a few extra teaspoons (not tablespoons!) of Ghee. 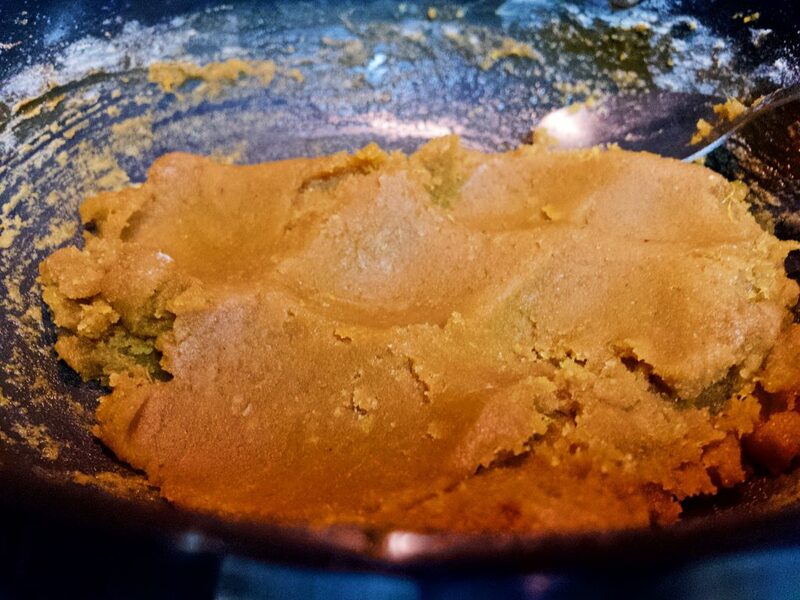 Once it is mixed well, take out the halwa in small bowls and glaze with half a teaspoon of ghee on each serving. Make sure to not wait for too long before serving as this ghee based dessert tastes best when it is warm. Serve this delicious Assidat al boubar/ Emirati Pumpkin Halwa warm with some crushed saffron strands on top or even some date syrup for extra sweetness. The key to roasting any flour is to cook it on medium low or low heat and to pay attention to it by moving it around the kadhai. If the flour is not moved or stirred continuously in a hot kadhai, the bottom layer will start burning and you'll see the colour change. You can also read about this in our Kasaar recipe.